Manly Beach was named after the strikingly healthy and handsome indigenous people who first lived in the area. Back in 1903, it was one of the first seaside resorts to allow daylight swimming and surfing. These days, Manly is an upmarket Sydney suburb by the water, offering fine beaches, heritage architecture, shopping, dining, and bush walks. The ferry journey alone, from Circular Quay to Manly Wharf, is a must-do Sydney experience. If you’re traveling with little ones or prefer gentle waters, step straight from the ferry onto the sand of Manly Cove. This harbor-side beach is perfect for leisurely swimming, fishing or sailing. Explore the rocky coves and tidal pools or unroll a picnic blanket; protected Manly Cove is a great option when the onshore winds are blowing. For wave action, head across The Corso to famous Manly Beach, which is patrolled by surf lifesavers year-round. If you’ve never tried surfing, book a lesson at one of the surf schools and catch the waves at what is thought to be the birthplace of Australian surfing. When you’re not soaking up the sun, the suburb of Manly is picturesque and offers lots to do. Rent a bicycle and explore the many oceanfront bike paths. Stop by Manly Art Gallery and Museum, renowned for its collection of Australian ceramics and paintings by local artists. Head up the hill to North Head and take in the spectacular views over the entrance to Sydney Harbour, and then back to the city. For the kids, the area is dotted with well-equipped playgrounds, and in the evenings the Manly Surf Club is a great place for a relaxed family meal or a drink. Upscale pubs, restaurants serving “mod-Oz” (modern Australian) cuisine, juice bars and coffee shops are plentiful in Manly. If you’re in the mood for a more classic dish, look no further than the Manly Fish Café. This is one of the longest running seafood restaurants in the area and the café’s fish and chips are legendary. From Circular Quay, enjoy the 30-minute ferry ride to Many Wharf. Buses also run between downtown Sydney and Manly, and plenty of metered car parking is available. Your next big adventure is right in front of you! You might want to try out a Manly Beach & Sunset Cruise or a 5-Day Sydney & Surrounds Backpacker Adventure Tour. For even more activities, check out our Sydney things to do page. With direct access to the beach, this Manly hotel is within 1 mi (2 km) of Manly Wharf, Manly Beach, and Shelly Beach. Curl Curl Beach and Warringah Mall are also within 3 mi (5 km). Situated near the airport, this guesthouse is within 1 mi (2 km) of Manly Wharf and Manly Beach. Shelly Beach is 1.2 mi (2 km) away. 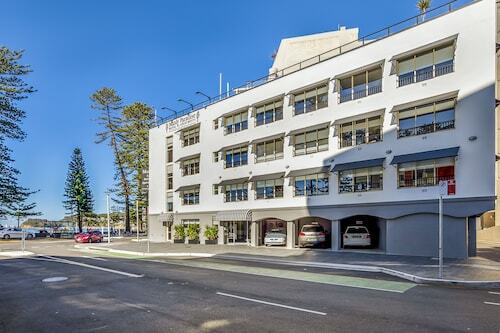 Offering direct access to the beach, this Manly apartment building is within 1 mi (2 km) of Manly Wharf and Manly Beach. Shelly Beach and Dee Why Beach are also within 3 mi (5 km). Located in Manly, this beachfront motel is in the city center and within 1 mi (2 km) of Manly Wharf, Manly Beach, and Shelly Beach. Curl Curl Beach and Warringah Mall are also within 3 mi (5 km). Situated in the entertainment district, this apartment building is within a 10-minute walk of Manly Beach and Manly Wharf. Shelly Beach and Taronga Zoo are also within 6 mi (10 km). 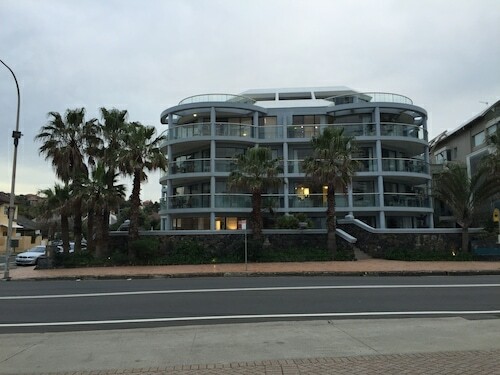 Situated on the Strip, this lodge is within 1 mi (2 km) of Manly Wharf and Manly Beach. Shelly Beach is 1.5 mi (2.4 km) away. 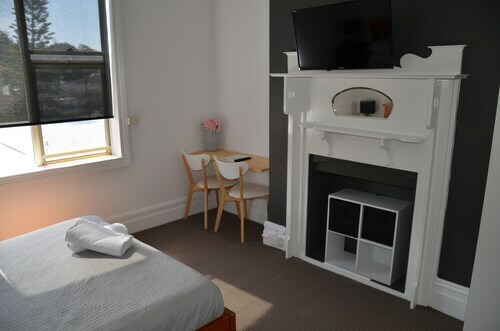 Situated in the entertainment district, this motel is within 1 mi (2 km) of Manly Wharf and Manly Beach. Shelly Beach and Dee Why Beach are also within 3 mi (5 km). Nestled on the beach, this Manly hotel is within a 10-minute walk of Manly Beach, South Steyne Beach, and Manly Wharf. Fairy Bower Beach and Manly Art Gallery and Museum are also within 15 minutes.